ellura is the most potent 36 mg PAC DMAC/A2 product available. Other "36 mg PAC" "me too" products are questionable and contain very weak PAC. Only ellura delivers 100% Anti-Adhesion Activity. One ellura capsule daily is a non-antibiotic alternative in the management of recurrent Urinary Tract Infections (rUTIs). ellura aids in reducing frequent UTI related doctor visits and preventative antibiotic use for rUTIs. Antibiotics should be reserved for treatment, not prevention. ellura is a proven, natural way to prevent UTIs without the side effects or bacterial resistance associated with antibiotics. ellura's standardized and clinically proven 36 mg PAC DMAC/A2 is extracted from 100% pure cranberry juice concentrate, not "whole berry" like substandard products. ellura is an approved medicine in 8 countries. Be careful... Just because a product claims "36 mg PAC" doesn't mean it contains 36 mg PAC DMAC/A2. Other quantification methods such as cPACs, European Pharmacopoeia (Ph. Eur. ), vanillin, Bate Smith, RP-HPLC, Hawthorn or BL-DMAC can be used to measure PAC content. All of these measurements overstate the PAC content by 2 to 5 times. Another critical consideration is the AAA (Anti-Adhesion Activity). Think in terms of potency and whether or not your body will absorb the PAC so it can work actually inside your body. 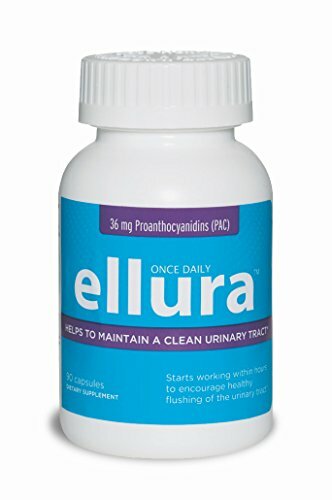 ellura only contains soluble PAC that your body can use to prevent UTIs. Low cost "me too" products are generally made of poor quality insoluble PAC that that are not readily absorbed. Insoluble PAC offer very little if any protection. Don't waste your money on substandard "PAC" products. Only ellura is 36 mg PAC DMAC/A2 delivering 100% Anti-Adhesion Activity. Medical-grade supplement: PAC is extracted from deep within the pure juice concentrate of cranberries. That is where the active ingredient resides. Not in the left over skins, seeds and stems or whole berry like other supplements. Don't confuse ellura 36 mg PAC DMAC/A2 with other "me too" supplements. They may list milligrams of cranberry extract (not PAC) on their labels or they claim to have "PAC" but have not been validated by the internationally recognized DMAC/A2 method. If you have any questions about this product by ellura, contact us by completing and submitting the form below. If you are looking for a specif part number, please include it with your message.